Whether you pot them up individually, or plant them in a terrarium or interesting planter, succulents are an easy addition to your home. Light; Succulents prefer bright light. The plant will tell you if it is getting the right amount of light. Too much and the leaves may scorch and turn brown or white. This can happen when keeping them indoors by a window. Too little, the plant will start to stretch and the leaves will become more spaced out as it tries to reach more light. Temperature; Succulents are much more cold-tolerant than you might think. In the desert there is often a marked contrast between night and day; succulents thrive in colder nights, getting down as low as 4 degrees. However, most of them don't like frost. 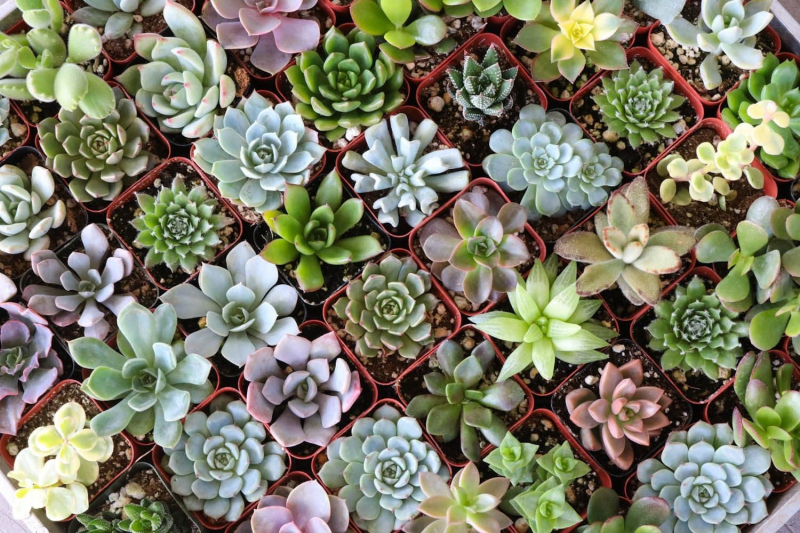 Succulents ideally like daytime temperatures between 21 and 29 degrees and night time temperatures between 10 and 12 degrees. Potting soils; Succulents should be potted in a fast-draining mixture. Our Country Basket Potting Soil is perfect for succulents. Watering; Potted succulents should be watered generously when needed, but allow the potting mix to dry between waterings. Overwatering causes plant rot which is the single most common cause of plant death. NEVER let your succulent sit in water! FACT; Cacti are a unique subset of the succulent group. All cacti are succulents, but not all succulents are cacti! If you have any questions or concerns, please contact us by phone, email or pop into the garden centre.